It gives me great pleasure once again to witness the graduation of another cohort of students of the college. As the Catholic Church In Swaziland we are grateful for the collaborative partnership that exists between the Church and His Majesty’s government and other stakeholders which enables the college to fulfil its mandate to the Swazi nation and to the Nursing Profession. Through partnerships, inter alia, the college has been granted the approval to introduce two new programs: a post-diploma certificate in midwifery, for which the first intake of students has already taken place; and a diploma in occupational health and safety, for which the first intake of students is projected to take place at the beginning of the next academic year. 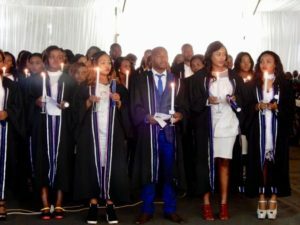 We are grateful for the assistance the college has received from the World Health Organisation, United States Peace Corps, the Swaziland Nursing Council, inter alia, which has led to the materialisation of the midwifery program. Dear graduating students, It is our ardent hope as the Catholic Church in Swaziland and as the Swazi nation at large that during the time you have spent at the college you have not only gained the necessary knowledge which will empower you to be excellent carers and helpers of the sick, the frail and the elderly but that you have also acquired those attitudes which will enable you to do this selflessly, seeking the well-being of those you serve tirelessly: giving and not counting the cost, fighting and not heeding the wounds. Rejoicing that in doing this you are following in the Redeeming steps of Jesus Christ who came not to be served but to serve and to give his life as a ransom for all. As you start your professional lives may you inscribe the words of the Nightingale pledge in the depths of your heart so that wherever you are and in whatever circumstance you find yourself you may serve with heroic distinction, unwavering excellence and impeccable professionalism.